The Human Body consists of approximately 70% Water and the Kidneys are the controllers and prepare for the distribution of this body fluid. The Kidneys filter it, purify it and keep it at the right volume to give you a healthy blood pressure. Water is processed by the Kidneys and then excreted (gotten rid of) in the urine. Most people have two Kidneys, which are organs shaped like kidney beans, each one about 10-15cms. (4 - 9 inches) long, being located either side of the spine, deep in the abdomen. When you drink Water you may have to go to the toilet in approximately half an hour. This is natural and exactly what your Kidneys are there for - to keep the right amount of Water in the body and to purify the blood. On average, good foods, especially fresh veggies and fruits provide for about 20 percent of our total water intake, whilst the remaining 80 percent comes from water and beverages of all kinds. Most mature sedentary adults lose about 2.5 to 3 liters (19 - 23 c.c. 's) of fluid per day. An air traveler may lose up to 1.5 liters (12 c.c's) of water during a three-hour flight. If the body is in a healthy balance, approximately 80% of ingested fluid is excreted within an hour. The amount of fluid you need to drink depends on your size, activity level and the weather. If you have severe kidney disease, consult with your health care provider / family physician for guidance as to whether you need to limit / monitor your fluids and check how much fluid you should be consuming each day. We absorb water from drinking and from food. We normally only drink when we feel thirsty. We feel thirsty when part of the Brain, called the "thirst center", senses when our body fluid levels are getting low. It prompts us to drink so as to top up our fluid levels and keep our blood pressure normal. Water is absorbed in to the blood stream through the small & large intestines. The water absorbed from the Digestive System is transported around the body in the bloodstream and used to top up your body fluids. Only about 7% of your body's fluids are in the blood. The rest of it is in your body tissues, in your cells and in the spaces in between the cells. If we don't get enough fluids, the cells dry out and your blood pressure drops. This condition is known as Dehydration, a serious problem common to almost 40% of the so-called western populations, whilst the suffering of others where fresh water and good nutrition is hard to come by, are in a life threatening crisis. 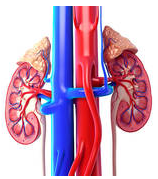 Your kidneys form urine by forcing your blood through a fine filter of blood vessels called the Glomerulus. All the blood cells and the larger molecules stay in the blood and only excess fluid and small molecules are strained through in to the urine collecting tubule. As we don't want to lose all the small molecules, some minerals and salts are reabsorbed from the collecting tubules and other molecules are transported directly from the blood in to the urine collecting tubules (excretion). This leaves us with the urine. Once the urine is made inside the kidneys, it is collected in to a funnel which sits over the kidneys (the renal pelvis) and then goes down the Ureter on each side to the urinary bladder. The wall of the bladder is very muscular so when we want to urinate, the bladder contracts and forces the urine out the Urethra. Most of us can hold about 450 ml. of urine in our bladder before having to go to the toilet. Blood plasma is the straw-colored/pale-yellow liquid component of blood that normally holds the blood cells in whole blood in suspension. It makes up about 55% of total blood volume. Water is, by far, the most common liquid on Earth. Liquid is one of the three classical states of matter (the others being gas and solid). Blood is a specialized bodily fluid in that it delivers necessary substances such as nutrients and oxygen to the cells and transports metabolic products away from those same cells. Metabolic Wastes or Excretes are substances left over from excretory processes, which cannot be used by the organs. that the Kidneys are necessary to maintain life and keep the body healthy. It is therefore essential to realize and appreciate the importance of keeping this filtration system well cleansed at all times.